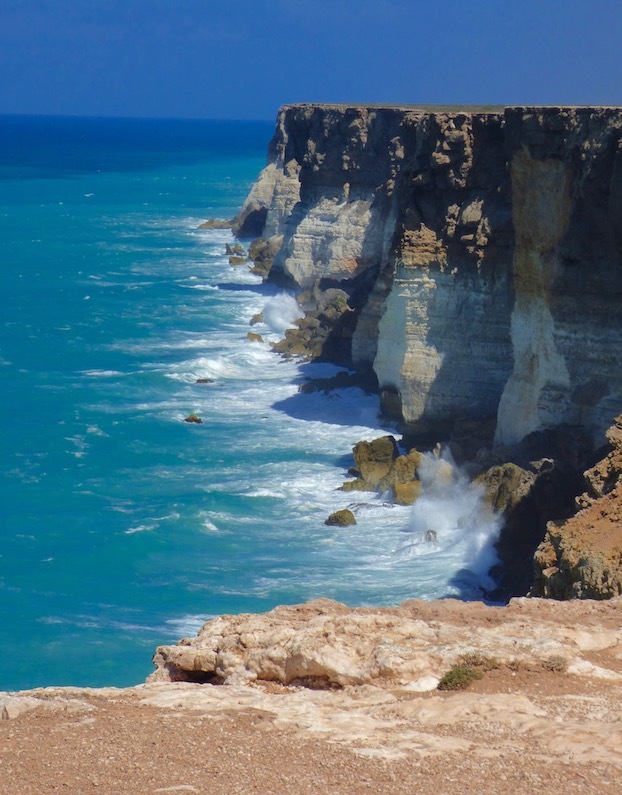 Galley Wench Tales: Oz's Legendary Nullarbor - What's It Really Like? Oz's Legendary Nullarbor - What's It Really Like? Window cartoon at one of the Nullarbor's Road Houses. Western Australia. 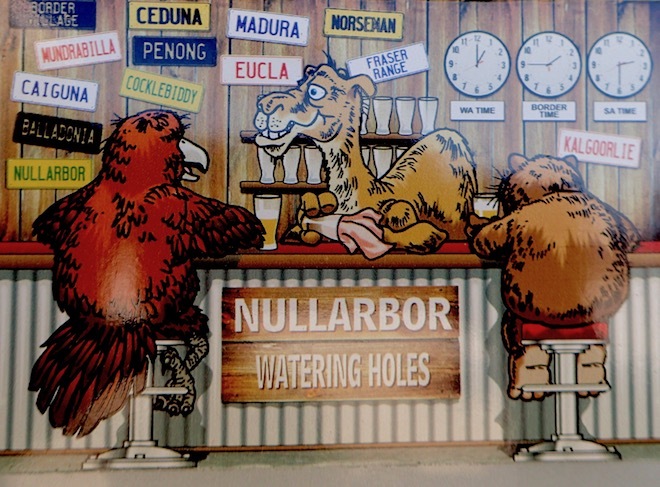 Tell your typical Ozzie you plan to cross Australia's legendary Nullarbor and watch their reaction. The responses we got were akin to sharing our plans of crossing the South Pacific -- concern, disbelief or awe. The Nullarbor -- a vast mostly treeless flat plain -- covers area of 77,000 square miles (200,000 square miles), stretching across the territories of South and Western Australia. 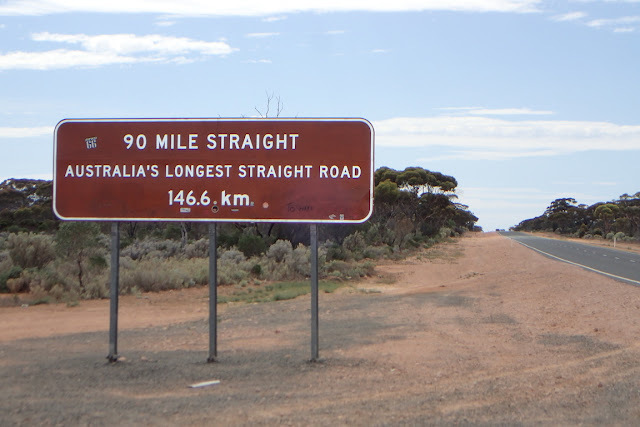 You may hear it referred to as Australia's biggest, baddest road, complete with warnings and special preparation instructions for prospective travelers on "how to survive" the Nullarbor abound. 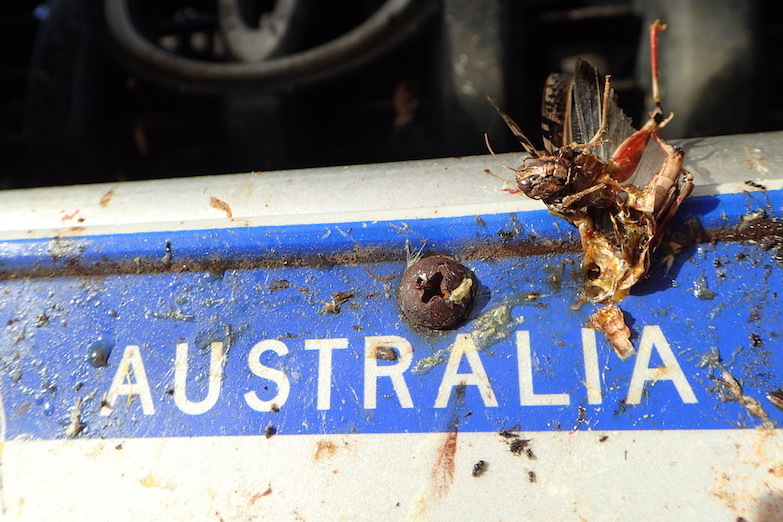 Not all survive Australia's rugged Nullarbor, though it seemed most casualties were winged or marsupial. This is our Land Cruiser's license plate, after completing our crossing. Heck - there's even the the mythical half-naked feral Nullarbor Nymph, which spawned a comedic horror movie (no - haven't seen it -- yet). Thus, we were amused when we stopped to chat with a motorcyclist stopped at gas station, as we approached this legendary stretch. "'Numb and and bored' is what I call it," he said. We were pretty sure that witty remark wasn't one he made up himself, though he was about to embark on his 4th crossing. 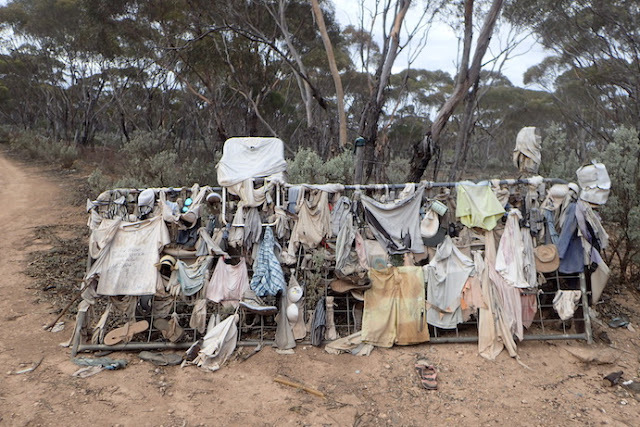 For him, the Nullarbor was not some wild outback adventure, but just a road he needed to cross to get to where he wanted to go. That set the tone for us, though our preparation did include Wayne's making sure we strategically chose our points to fuel up.... We were less concerned about running out of gas, and more concerned about not paying top dollar for it because we had no choice. For the record, we filled up at Port Augusta, Ceduna and Eucla. Likewise, despite carrying minimal food, we made sure setting out we had enough for several days. Typically most folks take 2-3 days to cross. 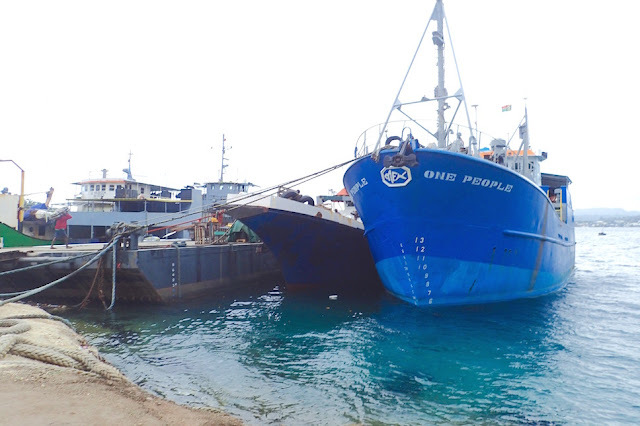 We knew most all produce was confiscated going from Western Australia to South Australia, but hadn't been warned that more the same was true going the opposite way. Luckily, we'd eaten a fair bit of produce before that South to West Australia crossing, but our stores took quite a hit and planned meals needed some adjusting. We also took heed of the need to carry plenty of water, as this is a parched country, and in this particular stretch we knew there was little water and less still fit for consumption. Wayne humors me whilst I mug for the camera at a Nullarbor Road House. Australia. Still, it's hard to be that awed by a stretch of road that driving along at pace a bit below the speed limit, we still encountered a road house every few hours. For the uninitiated, road houses generally offer fuel, a convenience store with some food and lots of souvenirs, a cafe and lodging. There's also often a little museum, and a golf hole, part of the "the world's longest golf course" -- the Nullarbor Links. As well, while there wasn't what you'd call traffic, it also wasn't that unusual to encounter fellow travelers. The road is rife with kitsch. Where else will you encounter road crossing signs warning you to watch out for camels, emus, kangaroos, and wombats? We never saw a camel, but did see quite a few dead 'roos as well a murders of crows and sometime eagles feasting on the 'roo carcasses. 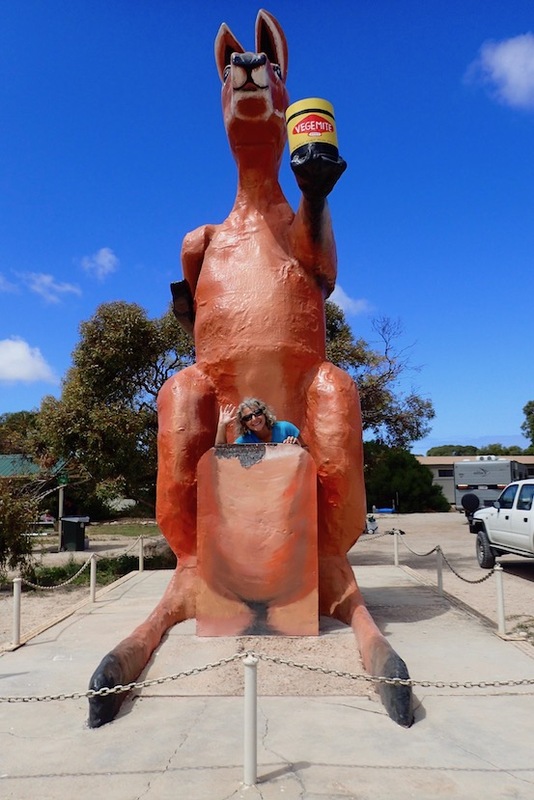 Where else would you find a larger-than-life kangaroo statue designed so you can pose as a "joey" in its marsupial pouch? Where else would you find tree skeletons festooned with thematic decor ... Christmas ornaments, underwear, hats/caps, shoes/flip-flops, CDs and stuffed animals. We never stopped in time for a photo of them. 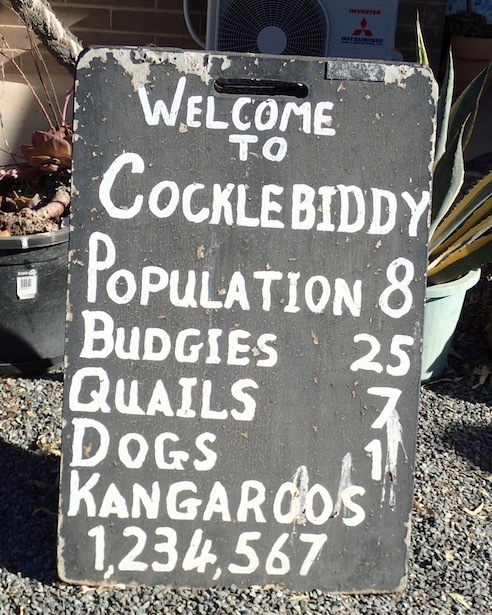 Yup - Cocklebiddy is really a place. They even have their very own time zone. Despite the overall monotony and general silliness of most of the Nullarbor, there are places and moments of breathtaking beauty. 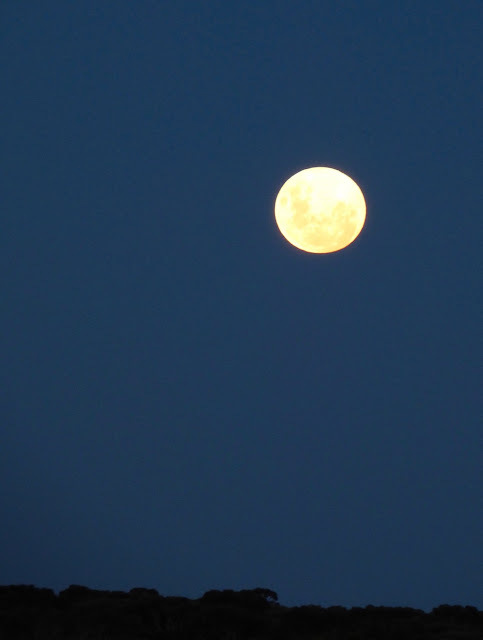 Full moon, Cocklebiddy Roadhouse. Nullarbor, Western Australia. We witnessed a magnificent full moon (which actually bummed us out a bit as it obliterated what otherwise would've been an awesome starry sky devoid of urban light pollution), followed one of the reddest dawns I've ever seen. 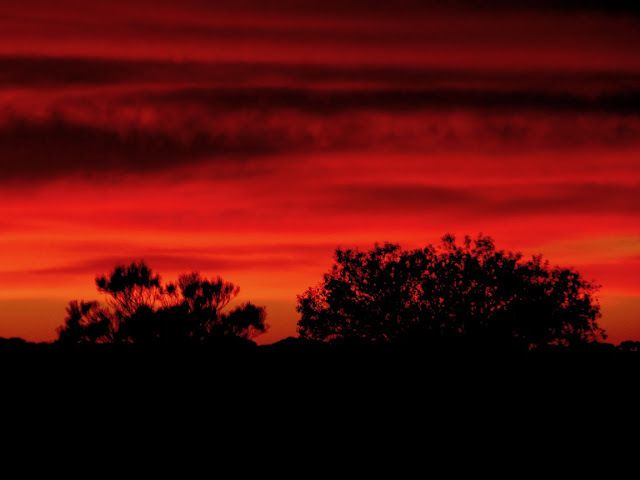 Dawn, Cocklebiddy Roadhouse. Nullarbor, Western Australia. The Bunda Cliffs, all well-signed photo-op signs just a quick stop off the road are quite spectacular as well. 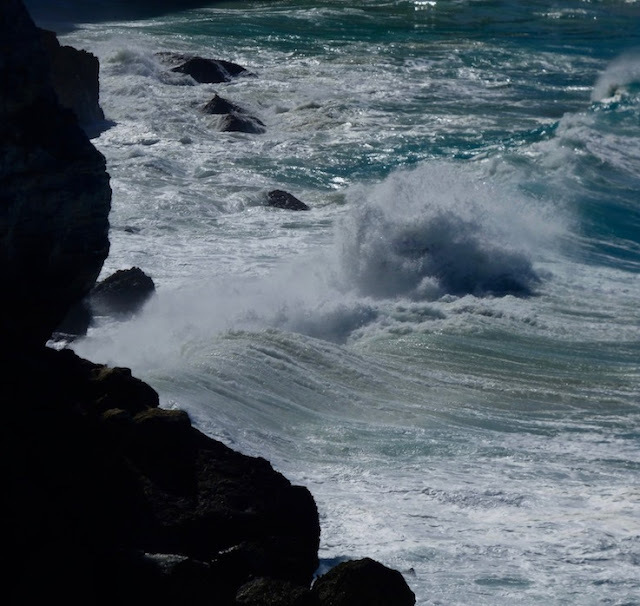 Waves crashing against Bunda Cliffs, Australia's Nullarbor. 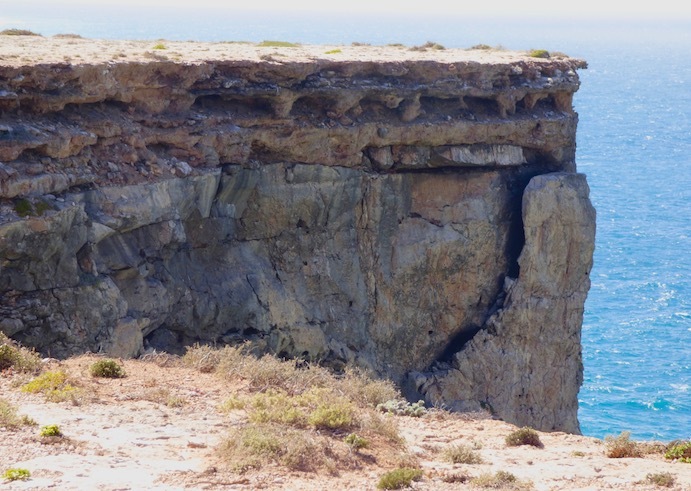 Erosion, Bunda Cliffs, Nullarbor, Australia. Ultimately, we cut off the last leg of the Nullarbor. Instead we drove ~200km (~125 miles) across a 4-wheel drive dirt road. We bypassed Norseman to come out by verdant seaside town of Esperance, where the coastline is breathtakingly stunning -- all the more so after 3 days of dust, flies and gray-greens. Seen on the 4-wheel-drive shortcut we took off the Nullarbor. This road struck us as more worthy of bragging rights though clearly we were not the only ones who took this road. We saw only 2 cars in 200 km. Honestly, we challenge those ready to pat themselves on the back for "surviving the Nullarbor" to take the cutoff, or to head off to the sheepherding station of Mt. Ives (we -did - more on that in a future post), or maybe take the former railroad trail (we were tempted, but not sure where the road reconnected -- we're not that foolhardy!). 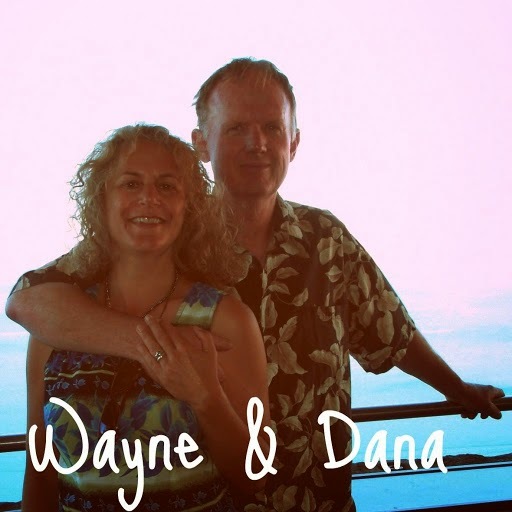 Maybe spending over a month at sea, over 3,000 miles when we traveled the longest unbroken stretch of ocean where we saw only 3 other boats made us a little jaded. Three days on the road just doesn't seem nearly that desolate in comparison. Nullarbor sign. Seems to be more worthy of dull-and-bored than worthy of bragging rights. Australia. This post was written about our recent "trek" across the Nullarbor, from March 11-13, 2017. We are currently about to leave Perth, Western Australia, heading Northward as we continue our clockwise circumnavigation of Australia. Oz: Weird S---O-Meter Pegged -- Again! Oz - More Transitions! What Bit the Dust? Oz: “Drop Bears”-- Fact or Fiction?